Sinds enkele maanden heeft Fiona Jane Scott haar eigen productiehuis. Haar nieuwe ontwerpen worden gemaakt in gegoten steen. Zij patineert met een donkere antiek achtige tint en heeft momenteel een heel nieuw gamma beelden. Een nieuwe collectie mythe beelden met een prachtige uitstraling! De beelden zijn wintervast. Fiona has previously sculpted for most of the leading British stoneware companies, establishing a reputation across Europe for her Mythical creations and contributing to the rise in popularity of gargoyles and other fantastic creatures during the 1990's. She was also a member of the sculpture teams for the films Harry Potter and the Chamber of Secrets (2002) and Harry Potter and the Prisoner of Azkaban (2004). She now sculpts exclusively for Pheebert's so she can fulfil her passion for providing imaginative, high quality art for the garden at an affordable price. LIKE all fairies, Faith is full of fun and loves to play amongst the flowers and shrubs in the garden. One of her favourite games is hide-and-seek. VERY young but keen to learn the art of gardening, Emma sits and watches. Gardeners of all ages will be delighted to have such an attentive little helper. SUSAN’S lively expression can’t fail to raise a smile, no matter what the weather. 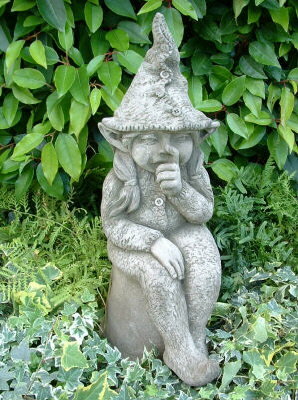 Who would not be delighted to come across this charming little pixie girl in their garden?